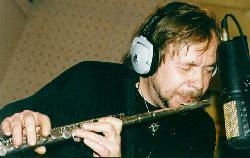 Born in Moscow, Russia Oct. 8, 1945, Anatole taught himself to play saxophones and flutes while in his teens. He played Russia's best jazz bands since mid-60s. In early 70s, world best jazz bands started to visit USSR: Duke Ellington Orchestra, then Thad Jones - Mel Lewis Jazz Orchestra, Toots Thielemans and others. Anatole played with all of them. This time playing jazz in Soviet Union became different because of Soviet bureaucracy's bad attitude to American music, and many jazz musicians have lost their job. Anatole left Russia for New York in 1973. Anatole Gerasimov has moved to Paris, France in early 90s. He worked there with Carlos Nascimento, the Urban Sax group and other World music bands as well as making music for movies and theater. In 1994, he first visited Russia since he became an umigru. He took part in record sessions with one of Russia's most famous alternative rock groups, the Auction. In 1996, Anatole has moved to his hometown of Moscow, Russia. He recorded his first Russian CD in Siberia's capital Novosibirsk the same year and formed a new group in Moscow. In 1997, he received the Jazz Master of the Year prize from Moscow Jazz Journalists Association and recorded an album during three live sessions on the air on a Moscow's jazz radio. His music video "Bloomdido" directed by Gregory Amnuel was shown on Russia's nationwide 2nd TV channel (Russia Television). 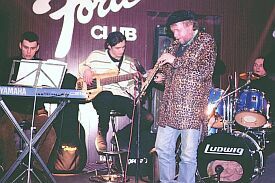 In 1998 Anatole played with his Moscow group in NYC at 2nd Sergei Kuriokhin International Festival (the Cooler, Merkin Hall etc. ), then took part in Russia's first moving jazz festival - The Jazz Province (8 cities in Central Russia including Moscow) and in 3rd Sergei Kuriokhin International Festival in St. Petersburg, Russia. 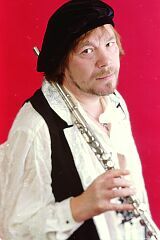 His latest CD contains his radio sessions of 1997 and is released by Russian jazz label Boheme Music. Recorded by Moscow's top jazz sound engineer Olga Moshkowa, the album is titled "Yes!" and contains Anatole's own music plus one standard ("Bloomdido" by Charlie Parker) in Anatole's arrangement. Anatole Gerasimov group includes Anton Sevidov, Yuri Pogiba (keyboards), Anton Revnyuk (bass guitar) and Dmitri Sevastianov (drums). This album could be purchased from Boheme Music directly or, if you live outside Russia, from Boheme International (Prague, Czech Republic). "To burn but not on fire"
Anatole Gerasimov, soprano sax and flute player, was born in Moscow, and started to play jazz while in his teens. It was 1973 when Gerasimov, having emerged as a star in Anatole Kroll's big band, defected to the United States where his first job was for Duke Ellington Orchestra. After Duke's death, Anatole played with NYC best jazzmen as a sideman or even as a soloist, but his main work was for TV and movies (for example, it was Gerasimov who wrote the song for 1983 blockbuster, "The Liquid Sky"). In 90, he lived three or four years in Paris, until returning to his home town of Moscow in 1996. When in Moscow, he formed a new group where he is looked as a "veteran" - nobody but him in the group is older than 30 (Anatole is 54), and the keyboard player, impulsive and full of energy viruoso Anton Sevidov, is only 18 years old. The album was recorded during Anatole's three appearances at Moscow Swing, Russia's only live radio jazz concert series. Aired on Rakurs, Moscow's funniest eclectic radio which was closed in early 1998 due to serious financial problems, Moscow Swing provided a weekly concert, played live in the station's special concert studio by Russia's best jazz musicians. Anatole played there three times during 1997; the resulting show tapes' sound encouraged him to choose nine best tracks and release it on a CD.